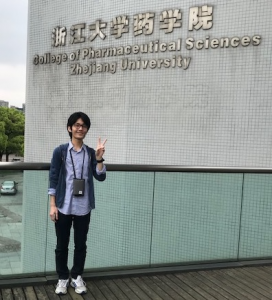 On April 20th to 24th, I stayed at the laboratory of Prof. Jianhua Qi for a collaborative research on identification of a conidium-inducing signaling molecule of Fusarium species, Fusarium asexual reproduction inducer (FARI). In this study, Prof. Qi’s group isolated trace amount of the active compound, however, the configuration of an asymmetric center had not yet been clarified. We synthesized (S) and (R)-FARI from (R) and (S)-limonene respectively, and determined that the absolute configuration of natural FARI was S. We also prepared deuterium-labeled FARI ((S)-FARI-d2) as an internal standard for the quantitative analysis with LC/MS, and revealed that the interspecies universality of FARI in Fusarium sp. These collaborative works were recently published on Angew. Chem. Int. Ed. (DOI: 10.1002/anie.201803329). This was the first chance for me to collaborate with researchers and students in foreign countries. In this stay, I learn big differences of research expense, manpower and so on between Japan and China. These experiences provided me a good opportunity to think how to compete with and survive among such country in scientific field. And of importance was that we Japanese students should turn our eyes to overseas and understand our present situation. This collaborative work motivates me to strive for my current research and to aim at an international synthetic chemist in the future. I’m grateful to Prof. Qi and the members in his laboratory for a warm welcome. This work was supported by JSPS A3 Foresight Program: Asian Chemical Probe Research Hub.